Local Search Marketing gets your website in front of your customer when they are looking for your products and services. 97% of consumers use online media when shopping locally. We configure your business to leverage this customer behavior. Local search marketing (aka location based SEO or local SEO) is similar to traditional SEO with the difference being the market or area being targeted. Local SEO is the basis of any local Internet marketing campaign. If you just need a Google+ Local Place Page configured or a full marketing campaign we will be happy to assist. 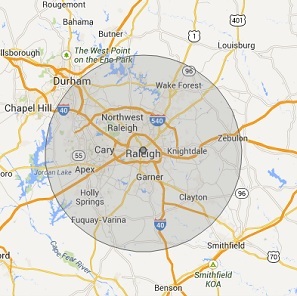 In this example, an area such as Raleigh, North Carolina is targeted. When someone is in the target area is searching for your services, and your Internet presence is properly managed, people find you. In every market there is an ever increasing number of competitors targeting the same pool of customers. Local search marketing focuses on proper setup, management, and staying on top of the frequent changes of your page’s settings in search engines such as Google, Yahoo, Bing and 50 others. Proper formatting of the meta data and the text on your site also helps reflect your location and the products or services that you offer to your community or service area. If you would like to get your website in front of your customer when it counts please give us a shout. 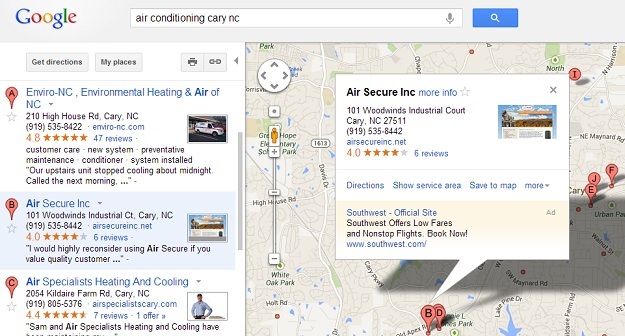 We offer local search marketing nationwide. We are an exclusive marketing company and accept 1 only niche per market.